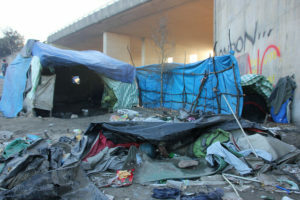 The Bar Human Rights Committee of England and Wales has today published a report on migrant camps at Calais and Grande-Synthe in France, highlighting allegations of police violence, police failure to protect residents within the camps, and a lack of access to justice. BHRC representatives visited the Jungle and Grande-Synthe camps in March 2016, meeting with residents and NGOs working within the camps, including Médicins San Frontières, the UN and Help Refugees UK. An Eritrean man who, when complying with a police request to get down from a lorry, was kicked and hit by officers and had tear gas sprayed in his face. Police inaction in response to other violence targeting camp residents, including a gun battle between rival people-smugglers in the former camp at Dunkirk, and “citizen violence” against refugees in the town and port areas of Calais. The report also underlines the high levels of overall police violence within the camps: a recent study by the Refugee Rights Data Project found that 76% of camp residents (and 82% of women) reported experiencing violence from the police, while 70% had been exposed to tear gas. Of the 700 children in the Calais camp, 78% of whom are on their own, over 61% reported “never feeling safe”. BHRC also draws attention to a lack of adequate legal advice or legal observers within the camps, which has contributed to misinformation amongst residents, and an inability to properly track or document human rights violations. BHRC has called on the French government to set up an independent investigation into allegations of police abuse and neglect of power in the camps, and for further human rights monitoring to be put in place urgently. “The lack of effective legal protections in the Jungle and Grand-Synthe for vulnerable refugees, including women and children, should be of huge concern.